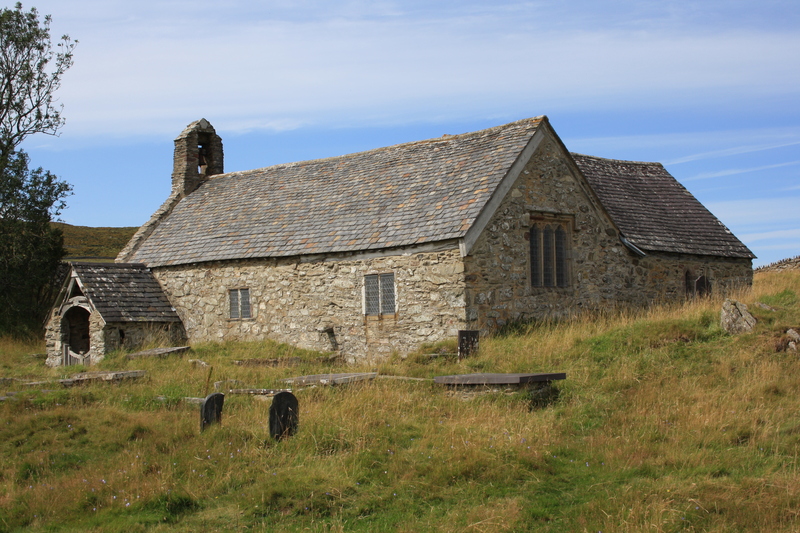 Llangelynin Old Church is high in the hills to the south of Conwy. Climbing up there provides a panoramic view of the river, Conwy Castle and the harbour. The church dates from the 12th or 13th century, probably built on the site of an earlier church. 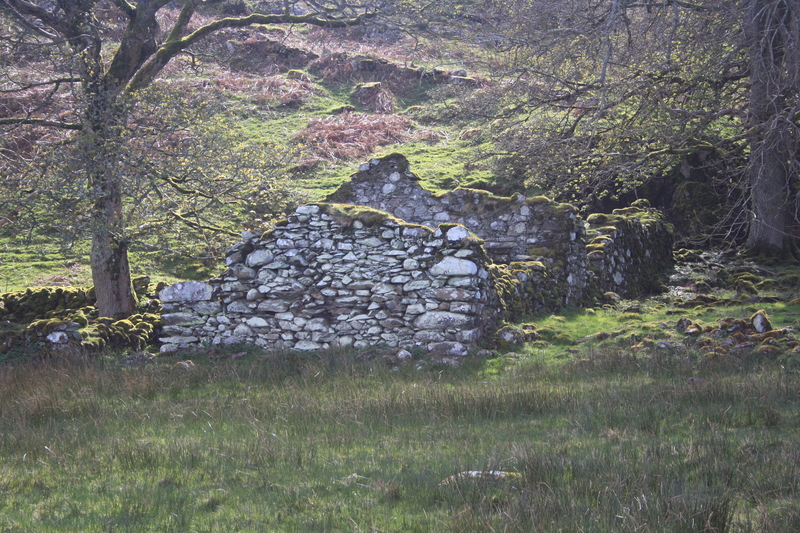 It has once been at the centre of a widespread rural community, as evident from the number of derelict houses littered across the surrounding hills. It is also on the route of an long abandoned road, the discovery of the foundations of an inn built against the church wall demonstrates that in the past this must have been a thriving community. The church was abandoned in 1840 as a result of shifting population, and replaced with a new building lower in the valley. The church is still used for three services a year, held on summer Sunday afternoons since there is no electricity for light and no heating in the church. The body of the church is in the form of an L shape, with two distinct chapels facing the altar. The second chapel is known as the Men’s Chapel. It is thought that the drovers would be accomodated here, to separate the unwashed and the uncouth from the remainder of the congregation. A third chapel was also added in the 16th century, but later demolished. the remains can be seen outside the church. 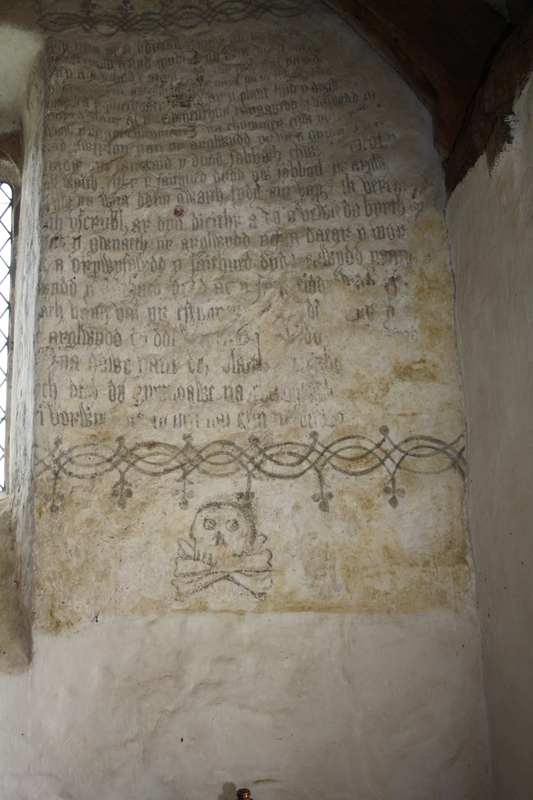 The church is plain with few memorials, the chief feature being the inscription of the Lords Prayer and Ten commandments in Welsh on the wall beside the altar, to which a skull and crossbones are appended. 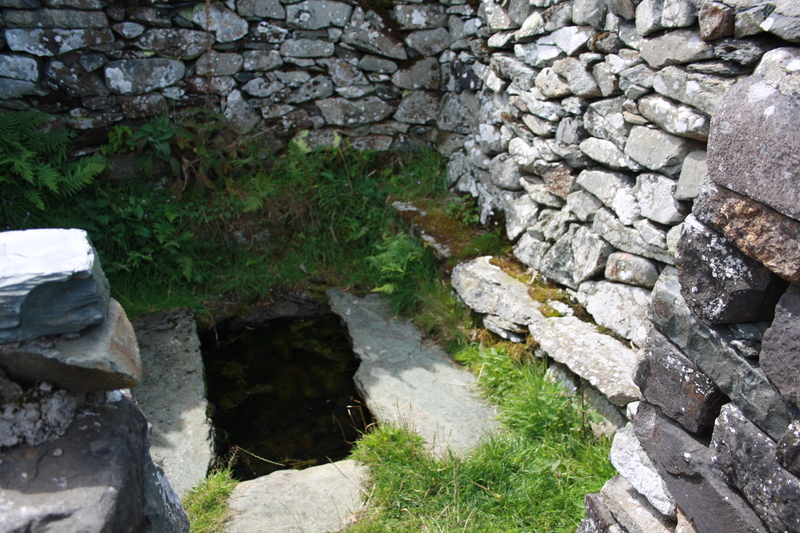 The well house is in a southern corner of the dry stone wall that surrounds the very uneven church yard. The walls surrounding the well and the benches have been restored, although the current layout fits a description of the site from 1739. The original well house according to records from 1622 was roofed. The well was believed to have powers to cure sick children, and children were brought from a wide disatnce around for cure. Sick children would be bathed in the well either early in the morning or in the evening and would then be wrapped in a blanket and allowed to sleep at a house at Cae Iol nearby. During this time their clothes would be washed in the water. the belief being that if the clothes floated then the cure would be successful, but if the clothes sank then the child would not recover. The remains of Cae Iol where the children were taken lie about 100 yards from the church. The Ancient Monuments record notes a post medieval farm house and a medieval platform house, I assume it was to the latter that children were taken, although I think only the more recent house is shown in the photograph. Celynin dates from the 6th century and was one of twelve sons of Helig ab Glannog, whose territories, between Penmaenmawr and Anglesey were flooded and now lie under Beaumaris Bay and Lavan Sands. It was said that the remains of Llys Helig could still be seen at very low tides a mile or so off the coast at Penmaenmawr. Loosing their family lands in this way the sons became monks at Bangor on Dee and Bardsey Island. 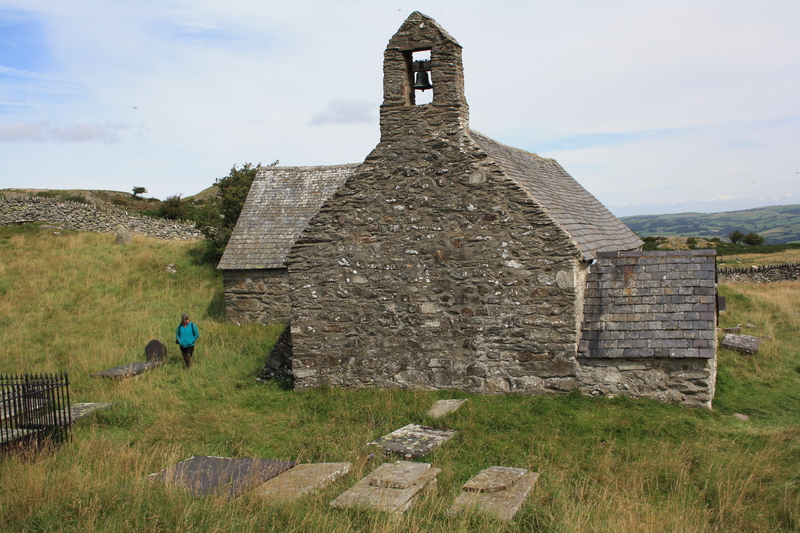 A second church dedicated to St Celynin is in Llwyngwril near Barmouth. The festival date for the church here is variously given as the 2nd or the 22nd of November. the calendars do not give a date for the festival of St Celynin. The enclosed churchyard covers a very wide area, there are apparently records of burials there dating back to the 14th century, however the rocky nature of the churchyard means that only some areas can be used for burial. A couple of hundred yards westwards along the drover’s path you can also find what we supposed to be Ffynnon Gwynwy. 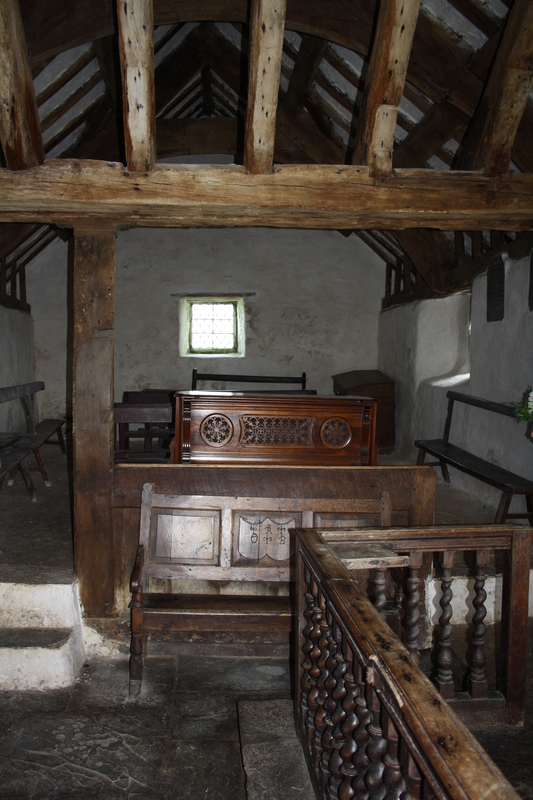 Llangelynin Old Church is near Garnedd-wen farm and is signposted on the roads up from Henryd. The route is a steeply climbing single track road, but there is parking space at the top, about 100 yards from the church. Interesting history. I like that this church is left open so you can see inside. My grandmother, Margery Dyke, used to be the church key holder when she lived at Garnedd Wen in the 1950s and 60s. I sometimes helped her serve tea in a chalet in her garden to walkers visiting the church. I have enjoyed re-visiting the Old Church recently while researching my novel, In the Line of Duty, which is based on my family who lived there when Garnedd Wen was first built just before the First World War. I’m sure there could be a good business in providing refreshments to visitors there, it is quite a hike to get up there. Were you aware of the well and its reputation too in those days? I(t is always one of my favourites and somewhere I return to often. I shall look out your novel, I am building quite a collection of literature related to wells and the areas surrounding, and although there’s no obvious direct link to this well in your work I’m sure it will paint a picture of how this area has changed over the last 100 years. 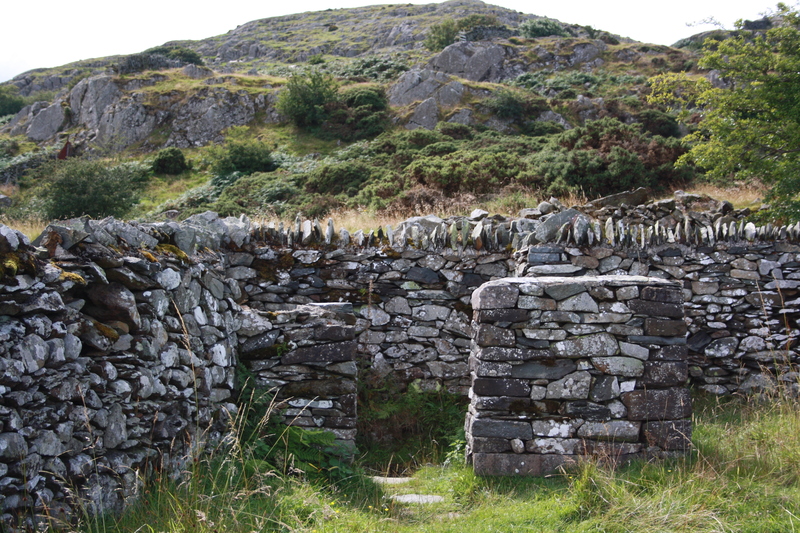 The interesting thing is that hikers were visiting the church over one hundred years ago, perhaps to visit the well although it was overgrown when my grandmother lived there. Hikers used to come up the Church Path from ‘new’ St Celynnin’s Church near Rowen where my grandparents are buried. I followed the path down but it appeared to stop in woodland and there is no longer a path joining the two churches. The Old Church, but sadly not the well, is an important feature in my novel and I have taken care to describe it and the surrounding area as it would have been 100 years ago. Myself and 3 friends used to stay at Garnedd Wen every August for riding holidays from 1976 to 1980. That must have been just after your grandmother lived there – it was run by Mr and Mrs Morris and we slept in a bunkhouse (converted henhouse!) When we weren’t riding we had amazing times roaming the mountains around the church including Tal y Fan and Daffodill Mountain. We spent a lot of time in the churchyard and I remember the well and what we were told was a witch’s grave. Very happy memories of that place and the church. It’s interesting that the well was overgrown in those days, it always seems so well kept now. I think this is indicative of a general observation that interest in these wells has expanded over recent years. Still I think the glorious setting of the church and the walks around it would have made it a draw for hikers over many years. I’ve never tried walking between the two churches though, a number of paths through the wood still appear on the map, though I don’t know which the original route was The old paths do still appear on the map although there does seem to be a break in what looks like the main one. I’m glad you have such lovely memories of your riding holidays at Garnedd Wen. One of my aunts started the riding school, sadly she died when she was 42 but her friend Tom continued the riding school. I am meeting two Norwegian friends in Llandudno next weekend; they have planned a trip so they can visit all the places I write about in my book. That must have been the same Tom that we knew – he used to take us out on the rides. I have photographs of him still! I remember the lady that we thought was his wife (maybe she wasn’t) wasn’t there the second year we went and we were told she had died. She was called Jackie, I think, so maybe she was your aunt. It’s a beautiful, haunting landscape up there and we have very much enjoyed reliving it all in your novel. My family lived in Deganwy, and my father would often take the family up to the old church. In the 80’s my mother had a fall and broke her ankle, and I raised the alarm by calling at Garnedd Wen, and Tom phone the emergency service and came to asist. Years later I discovered that the Sloane side of our family had lived at Bont y Weirglodd and Llanerch y fwch, two houses near to Garnedd Wen.